Breakfast Strata with Sausage, Mushrooms & Monterey Jack – Kind of an old standby for breakfast for a crowd. I love the way the bread puffs up and almost becomes fluffy. Mom’s Blueberry Scones – I swear when my mom makes these they are waaaaayyyy better. I think she’s holding out on a secret ingredient. 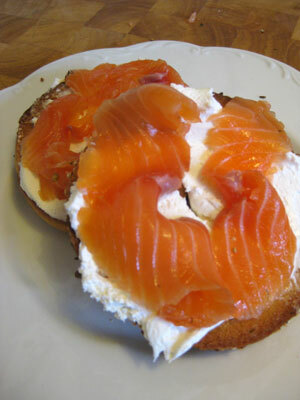 Bagels with Gravlax & Tomatoes – My latest cooking craze is making homemade gravlax. It’s so easy (recipe below) and it’s so much better than what you can get at the store. Sweet & Spicy Bacon – Great for a brunch, as you can bake it in large batches and it can be made a day ahead and reheated. Coating the bacon in flour results in super crisp, crisp, crisp bacon. Did I say crisp? Fruit Salad with Lime Creme Fraiche – I used winter season fruit (apples, pears, bananas and a crazy cinnamon/persimmon hybrid) and dolled it up with a sweet, lime creme fraiche. Roasted Asparagus with Mustard Lemon Sauce – I found teeny, tiny, skinny asparagus and quickly roasted them with olive oil and salt. Stumptown Cold Brew – I am straight-up addicted to this coffee. And I don’t drink coffee. I asked a friend to pick up a few bottles from the restaurant where he works (I don’t know where to get it otherwise) and it was the hit of the party. I am incredibly saddened that it can’t be ordered online, but I’m eying this as a substitute. Combine sugar, salt and pepper in a small bowl and mix well. Coat salmon on both sides with mixture and put in a shallow dish. Pack the remaining mixture on top of and around the fish. Lay dill on top and cover with plastic wrap. Place in fridge for 42 hours, checking daily and draining any excess water that accumulates. After 42 hours, quickly rinse salmon and pat dry. The salmon can be wrapped in saran for up to 7 days. Slice as thinly as possible and serve.